This is a quick and easy supper main course. The thing is to buy the best quality steak you can buy. 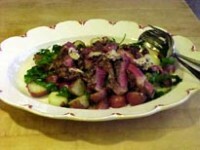 (I bought this steak which was prime grade at Bryan’s on California Street), and to serve it with roasted potato and parsley salad—delicious! I pit the olives by hitting them with a meat pounder, discarding the pits, and chopping the olives with a knife. 6 Nicoise olives plus 3 Tbs. Place the potatoes in a baking pan, coat with olive oil, and sprinkle with salt and pepper. Place in a 400 degree oven, and roast for 20 to 35 minutes, until tender when pierced with a fork. Remove from the oven. Score the edges of the steak with a sharp knife to prevent it from curling when cooking. Rub the steak on both sides with olive oil, and sprinkle with salt and pepper. Set aside. Place the butter in a small bowl, and beat with a wooden spoon until soft and fluffy. 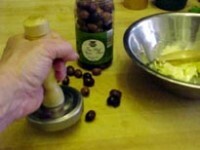 Remove the pits from the 6 olives, and coarsely chop the olives. Mix the olives with the butter adding a pinch of salt and pepper. When the potatoes are cool enough to handle, cut them in half and place them in a medium-sized mixing bowl with the remaining olives and the leaves from the Italian parsley. Add the vinegar, 2 Tbs. olive oil, and salt and pepper to taste. 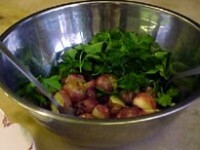 Toss the warm potato salad and place on a serving dish. Get a charcoal or gas grill very hot. Or, place a ridged iron pan over high heat on top of the stove for 10 minutes until smoking hot. Place the steak in the middle of the grill and grill over high heat. 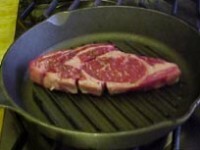 To make a grid, turn the steak at 50 degree angle. Grill the steak on both sides for about 3 minutes, until the meat is semi firm when pressed with the finger. Remove from the heat and place on a wooden board to cool for 5 minutes. With a thin sharp knife, slice the meat into wide slices and place over the potato mixture. Dot with olive butter, and serve immediately.